Devin Heffelfinger had to evacuate Shasta County for more than two weeks and he had to leave behind a family pet when the Carr Fire threatened to destroy his home and hundreds of other structures. Heffelfinger was surprised when he returned home from Montana to find his fish, Grant, still alive after he had already told his daughter that Grant was probably dead. Cal Fire firefighters and officers from Corning Police Department kept the fish "well-fed" in the family's absense. 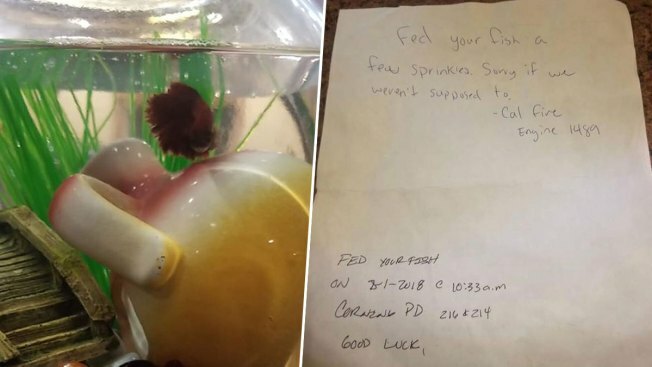 "Thank you Corning PD and Cal Fire for feeding our fish 'Grant' we had to inform our daughter that her fish was more than likely dead after more than two weeks of evac," Heffelfinger wrote on Facebook. Cal Fire and Corning Police both left a note for the family to find. "Fed your fish a few sprinkles. Sorry if we weren't supposed to - Cal Fire Engine 1489," Cal Fire's note read. "Fed your fish on 8-1-2018 @ 10:33 a.m. Corning PD 216&214. Good luck," Corning police wrote. Heffelfinger's daughter was "ecstatic," he told NBC Bay Area, after getting home from a relative's house in Montana to find their pet still swimming. "I don't even know how they got in the house. It was all locked up. We're out here in the woods. It's not like your in community," Heffelfinger said. His home on Muletown Road, 20 minutes away from Redding, was saved but he said the rest of his 5-acre property was completely destroyed by the blaze. Cal Fire later wrote Heffelfinger a message and said that the unit 1489 is based out of Brooks Fire Station from the Sonoma-Lake Napa County unit, he said. The two-week-old Carr Fire had killed eight people and burned more than 1,000 homes. 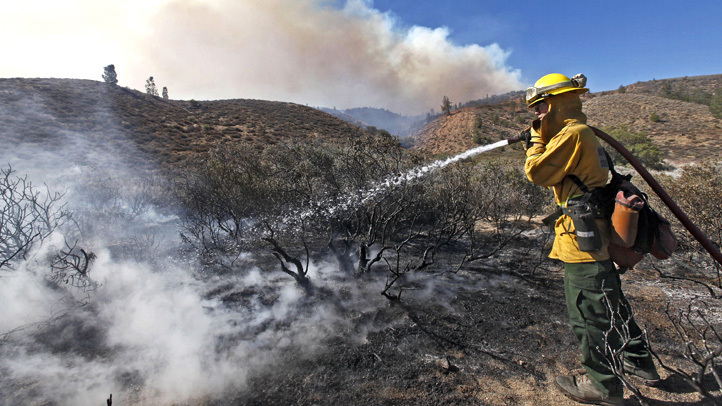 It was 51 percent contained as of Saturday.